The events of the past week in Ukraine have raised the specter of expanded Russian military intervention, political upheaval, and civil war. Moscow’s reputation in much of the country and in the international community is in tatters and is unlikely to recover soon, so long as the occupation of Crimea continues. The threat of greater U.S. and European sanctions against Russia remains if the situation does not improve. For now, however, the West should act on an emergent opportunity to help Ukrainians keep their country together. This opportunity is not about the joint statement that Ukraine, the European Union, the United States, and the Russian Federation negotiated yesterday in Geneva, which contains de-escalation measures that may or may not be implemented anytime soon. Instead, it has to do with the rise of legitimate constituencies in eastern Ukraine with which Kiev can and should negotiate the country’s future. When Vice President Joe Biden visits Kiev next Tuesday, he must encourage Ukrainian authorities to quickly make good on their pledge of an “inclusive” and “transparent” process of constitutional reform, as promised in the joint statement. Specifically, Kiev should announce its intent to formally establish a constitutional assembly that includes not only national-level politicians, but locally elected leaders and members of civil society as well. Such a process would provide a more inclusive and transparent foundation for the rebalancing of central and local government power, and among central branches of power, than the reform efforts that are currently underway. This process should be followed by a new cycle of presidential, parliamentary, and local elections. This crisis cannot be resolved by force. Ukrainian security forces were caught by surprise and were, and remain, ill equipped to resist a Russian-coordinated—and in many instances led—armed takeover of police, security, and other administrative buildings in the city of Donetsk and surrounding towns, as well as in Luhansk, the main city in the neighboring region. Acting Ukrainian President Oleksandr Turchynov confidently proclaimed the start of an “anti-terrorist” operation to combat what local Russian-backed separatists dubbed the establishment of the “Donetsk People’s Republic.” Ukrainian forces have defended a handful of facilities and used lethal force against armed attackers, and they should continue to secure and defend as many potential targets as they can. But pursuing a full-scale operation to take back occupied buildings and towns risks considerable civilian bloodshed, which will lead to an even graver crisis of government legitimacy in the east. Worse, such an operation threatens to lead to failure. The chain of command is tenuous, as is the logistical capacity of Ukraine’s force structures to carry out professional military and security operations. Even after the start of the Ukrainian government’s counteroffensive, separatist gunmen continued to take buildings and block roads. And as talks in Geneva proceeded, a local television tower was taken with ease, although it was subsequently vacated. In a particularly unsettling display of government weakness, two columns of Ukrainian armored personnel carriers were surrounded by crowds of gunmen and unarmed locals. In that encounter, most of the soldiers in one Ukrainian army column surrendered their weapons and returned to base. The other column surrendered its vehicles without a fight, accepted an offer of a hot meal, and agreed to leave town. Yesterday’s joint statement coming out of Geneva carries the promise of an alternative resolution to this growing crisis. The statement calls for the disarming of illegal armed groups and the return of seized buildings to their “legitimate owners,” among other measures, in exchange for an amnesty for most lawbreakers and the prompt establishment of a “broad national dialogue” on constitutional reform. The statement tasks the Organization for Security and Co-operation in Europe, or OSCE, Special Monitoring Mission as the lead external partner in the disarmament effort. Since the end of March, the OSCE has deployed more than 100 unarmed civilian monitors throughout Ukraine, and can deploy up to 500 monitors at one time. However, there are significant challenges to seeing through the actions called for in the joint statement. One might reasonably doubt Moscow’s commitment to a rapid de-escalation of a crisis it has so eagerly generated. A separatist leader in Donetsk has already said his group has no intention of abiding by the agreement unless the government in Kiev vacates its own “illegally” occupied buildings—an interpretation of the agreement that the Russian government might have intended from the start. In addition, Kiev has to itself ensure that members of Right Sector, the right-wing nationalist group that fought for regime change on the Maidan but has increasingly clashed with authorities, will lay down their arms. Fortunately, it is not necessary to rely on the joint statement to begin seeking a resolution to the ongoing conflict. The rise of armed separatist formations in the Donetsk and Luhansk regions has led to an equally vocal—but so far largely ignored—movement in those regions in support of defending local interests via legitimate political channels. Even before the joint statement was issued, local deputies from the former ruling Party of Regions in Donetsk adopted a resolution calling on rebels in the region to lay down their arms and vacate occupied buildings, in exchange for amnesty and extensive decentralization reforms. Deputies of the city council of Mariupol, the second-largest city in the Donetsk region, posted an open letter on the council’s website imploring separatists taking up arms to “leave Mariupol alone”—this after members of Ukraine’s newly created national guard killed at least two Mariupol residents participating in an armed attack against their local garrison. 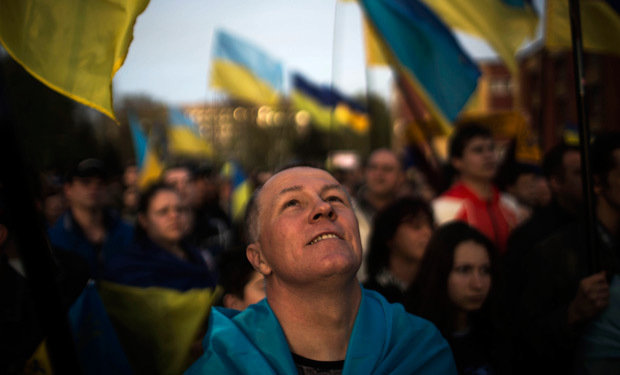 In the city of Donetsk, demonstrators rallied in support of a unified Ukraine. Immediately prior, university students, faculty, and staff in Luhansk held a similar demonstration. The joint statement notes that the constitutional reform process will include “outreach to all of Ukraine’s regions and political constituencies” and the “consideration of public comments and proposed amendments.” But it should go further than that. Kiev should incorporate local politicians, professors, and peaceful protestors from Donetsk and Luhansk, as from all other regions of Ukraine, directly into the process of restructuring the state. Authorities should announce their intent to establish a constitutional assembly made up of elected and civil society representatives from around the country to institute fundamental constitutional and political reforms. Such an assembly could also finally settle the question of the legal status of the Russian language in Ukraine—a key demand of many in eastern Ukraine and elsewhere who speak Russian as their native language—in accordance with democratic European norms. Kiev could go even further. The government could declare that once the new constitutional system is established, a new round of presidential, parliamentary, and local elections will be held. New parliamentary and local elections will be needed to allow Ukrainians to elect their leaders in the new constitutional context that will grant both parliament and local governments greater power. And while the upcoming presidential election in May is important for shoring up the existing government’s democratic legitimacy, the new president too ought to be a transitional figure, pending the adoption of the new constitution. Such a concession would reassure dissenters that the candidate who occupies the presidency will do so as an act of responsibility to the nation rather than being another power grab. The events of the past week in Ukraine have exposed the frailty of the country’s latest transition. Vice President Biden’s trip to Kiev next week should be as much about building a foundation for Ukraine’s civic unity as about the West’s unwavering support for its sovereignty in the face of Russian aggression.